Ricoh has announced a huge discount on the Ricoh Theta SC, which is now only $199! I don’t know yet if this is a permanent price adjustment or just a discount for the summer. The Theta SC has the same sensor as the Theta S, the most popular 360 camera and almost all of its features, including the best stitching in the industry. 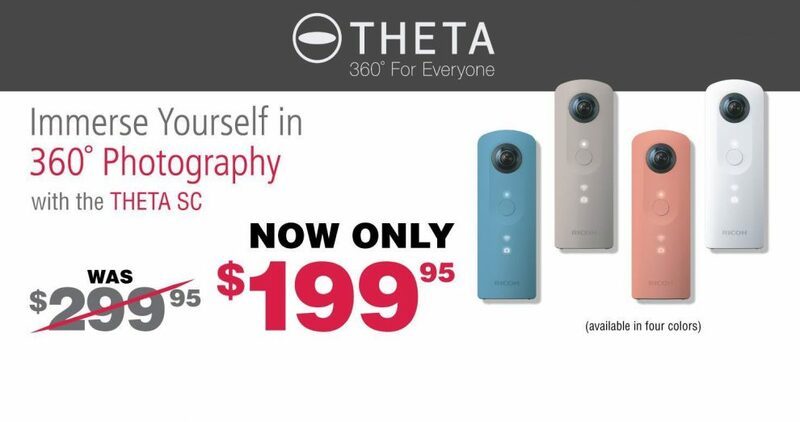 But at $199, it is almost half of the cost of the Theta S. This makes the Theta SC quite possibly the best value for 360 photography. Here is a review of the Theta S – almost all of which applies to the Theta SC as well, except that the Theta SC has no HDMI port, no live streaming, and has a 5-minute limit on videos. The Theta SC has interval shooting (an intervalometer) but I believe it doesn’t have interval composite, so if you want to do star trails, for example, you’ll need to blend the exposures yourself using tools such as Photoshop or Lightroom. Thank to you to MS and Tony Anastasi for bringing this to my attention! I think the 2016 Gear 360 (SM-C200) is a better value at below 100€ (there are tons of them on eBay, new in unopened boxes). Of course if you don’t have the right phone you have no live preview with that camera. Hi Sven. Yes I agree, if you have a compatible phone, the 2016 Gear 360 could be a better value and still has excellent image quality except for flare. This one is for those who want to focus on 360 photography. The exposure controls make it useful for that. you say that theta s is better for photography than gear360 2016 ( 7.7k photo) where thetas s photo is only 5.3k photo ? Hi Antoine. There are many factors to consider, not just resolution. An important factor for photographers is exposure control. Theta S has much more extensive exposure control compared to Gear 360. For example, shutter speed can be as slow as 60 seconds, long enough for night sky photos. Gear 360 cannot do that. Theta S also has the best in class stitching. Finally, I am wary of the blurgate issue. Those are the reasons I prefer to shoot with the Theta than Gear 360, despite the Gear 360’s excellent image quality. In any case, both are superseded by Xiaomi Mi Sphere, in my opinion.